Sidney Youngelman was born December 1, 1931 in Newark. He was the youngest of five children born to Max and Molly Youngelman. Sid’s family moved to Brooklyn when he was a boy and he became a standout basketball forward and football lineman for the Abraham Lincoln High team in the early 1950s. He captained both teams his senior year. Crude and boisterous, Sid was a favorite of teammates in both sports. Sid was recruited by the University of Alabama on a hoops scholarship but didn’t see eye-to-eye with coach Floyd Burdette. After missing a practice in 1951, Burdette threatened to throw Sid off the team. Sid shoved his head into a wall, prompting the coach to demand that he be sent home. Hank Crisp, the AD and football coach, gave Sid a choice: go back to Brooklyn or play football and hit people for a reason. Sid chose football. In 1952, Sid’s first varsity season, the Crimson Tide went 10–2 and destroyed Syracuse 61–6 in the Orange Bowl to secure a Top 10 ranking. Sid was a one-man wrecking crew in that game. In 1953, Alabama won the SEC championship. In 1954, Sid was named team captain and earned third-team All-SEC honors. 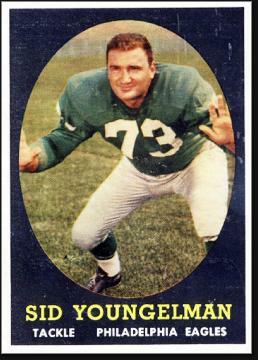 In 1955, Sid was the 83rd player taken in the NFL draft, by the San Francisco 49ers. He played for the Eagles from 1956 to 1958 and joined the Browns for a year in 1959, starting all 12 games. Sid got a break when the AFL began play in 1960. He signed with the New York Titans and earned All-AFL honors. Sid finished his career with the Buffalo Bills in 1963. From 1958 to 1960, Sid also performed as a pro wrestler, appearing in 26 matches. He won 13, lost 12 with one draw. Among his tag-team partners were Richard Beyer (aka The Destroyer) and Herb Gerwig (aka Killer Karl Kox). After football, Sid started an airfreight business in New York. When Jim Brown toyed with the idea of an NFL comeback in the 1980s, Sid reached out to his former teammate and advised him to stay out of football. He even offered Brown a job in his company. Sid passed away at the age of 60 in Lake Hiawatha, NJ.